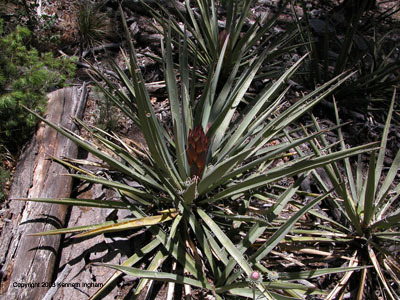 This Banana Yucca (Yucca baccata) was on the Sulfur Canyon/Faulty Trail/Bill Spring Trail in the Sandia Mountains on May 15th, 2003. The bloom stalk was just beginning to emerge. A conspicuous plant in many parts of New Mexico, banana yuccas have thick, fleshy leaves and a generally short, but stout appearance. The leaves, which have spines at the tip, arise from the central stem at ground level. In the spring when banana yucca blooms, it is an especially beautiful plant with its large showy white blooms. One of the most fascinating aspects of yuccas is the mutualism that exists between the yucca and the yucca moths (Tegeticula, Incurvariidae). See the ecology section below for more details. 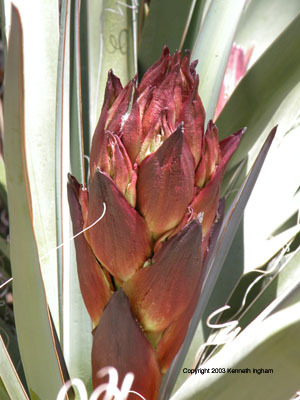 Plant height: Up to 80 cm tall (Benny's yucca page). Fruit and seeds: The banana yucca gets its name from the large fleshy fruits that are somewhat (sort of) banana-like in appearance. The seeds are flat, black, and lack wings. Benny's Yucca page. Flowers: The blooms, which are complete with both male and female parts, are large (up to 8-10 cm long and white or cream. The emerging bloom stalk is particularly beautiful (see the pictures below). Yucca flower in spring, April to May and sometimes June and occasionally you can see them flowering in other seasons as we just did in December 2003 in Carlsbad Caverns National Park. Elevation: 3500--7500 ft. (1070--2300 m) (Carter 1997). General: Perential, native subshrub that occurs throughout much of New Mexico. The thick, fleshy leaves that arise at ground level are spine tipped. Leaves: Green, fleshy, thick, and dagger-like with spines on tip. Fibers curl off along the margins of the leaves. You can see these curly fibers in the closeup photos of the bloom buds below. Habitat and range: California, Nevada, Utah, Arizona, Colorado and New Mexico. We see them a lot in the Sandia Mountains in the piñon-juniper habitats, but they occur in several other habitats including grasslands. 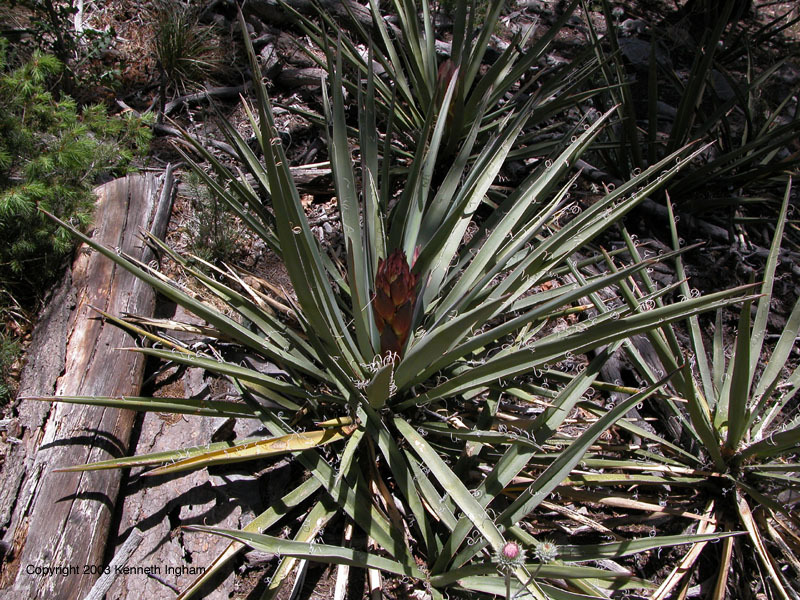 Benny's Yucca page and USDA Plant Database. Status: Not endangered in New Mexico. Ecology: One of the most fascinating aspects of yuccas is the mutualism that exists between the yucca and the yucca moths (Tegeticula, Incurvariidae). The seeds of the yucca provide the sole source of food for the moth larvae and the yucca moths are the only pollinators of the yucca. 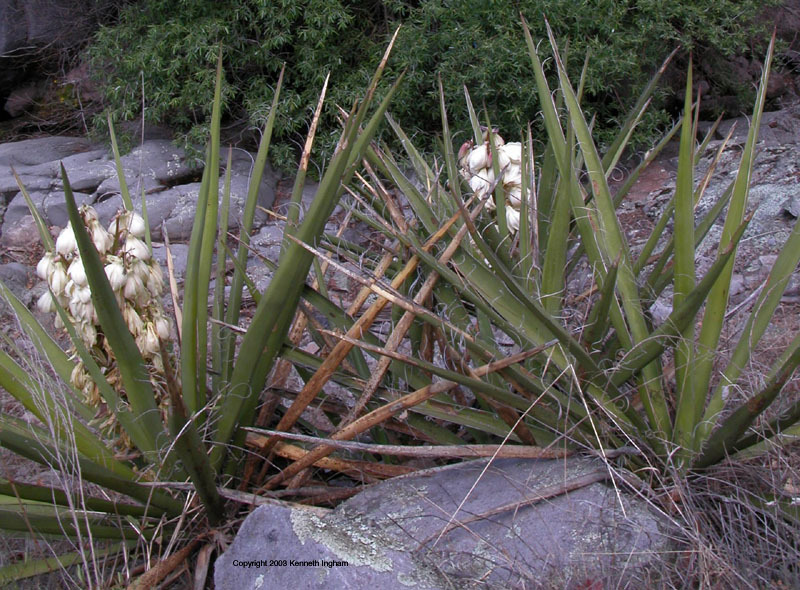 An interesting article on this mutualism in yuccas is: Addicott, J.F. and Bao, T. 1999. Limiting the costs of mutualism: multiple modes of interaction between yuccas and yucca moths. Proceedings of the Royal Society of London Series B Biological Sciences 266: 197-202. These authors have also found that more than 70% of Yucca baccata (banana yucca) cheat in this mutualism: Bao, T. and Addicott, J.F. 1998. 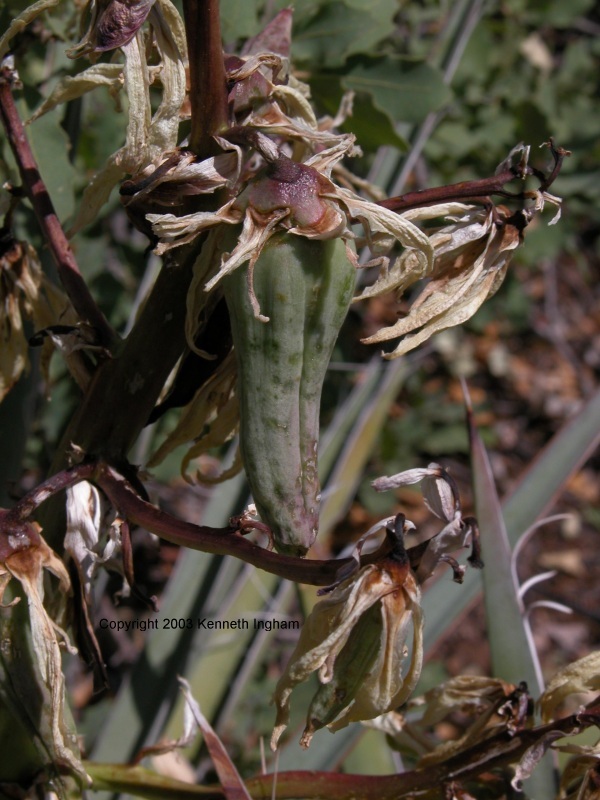 Cheating in mutualism: defectin of Yucca baccata against its yucca moths. Ecology Letters. 1(3): 155-159. There is a wonderful description of Native American use of yuccas, written by a Navajo Indian from the Diné Nation, at Medicinal Plants of the Southwest. 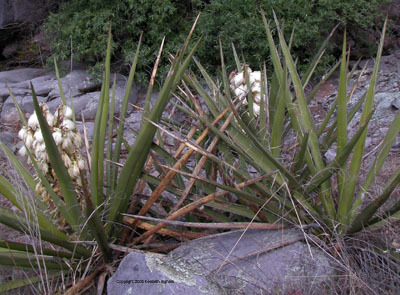 Yucca roots are sold in produce sections of supermarkets today, but Native Americans and others have eaten the roots for a long time. We've had a delightful dessert in Mexico that consists of ground yucca root soaked in sugar, made into patties, and fried. Yummm! Foxx and Hoard (1984) also mention "The fibrous leaves were used to make baskets, mats, cloth, rope, and sandals. Flowers and fruits were eaten. The root, when pounded and soaked in water provided a shampoo called amole which could be used for cleaning hair, feathers, or cloth. The suds were used to represent clouds in religious ceremonies." You can find a discussion of medicinal uses of yuccas in Moore (1989). 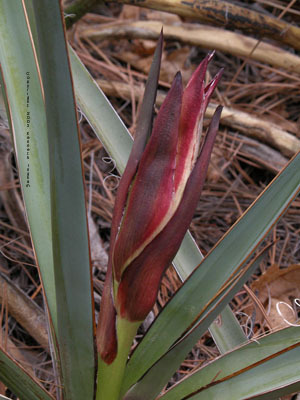 Closeup of emerging bloom stalk of a banana Yucca (Yucca baccata) on the Sulphur Canyon/Faulty Trail/Bill Spring Trail, Sandia Mountains, New Mexico, May 15th, 2003. Note the fibers curling off of the leaf margins. Closeup of emerging bloom stalk of a banana Yucca (Yucca baccata) on the Cienega Loop Trail, Sandia Mountains, New Mexico, May 24th, 2003. Note the fibers curling off of the leaf margins. Overview shot of banana yucca (Yucca baccata) in full bloom on the Railroad Canyon Trail, Black Range near Hillsboro, New Mexico, June 7th, 2003. Moore, Michael. 1989. Medicinal Plants of the Desert and Canyon West. Santa Fe (NM): Museum of New Mexico Press. Foxx, Teralene S. and Dorothy Hoard. 1984. Flowers of the Southwestern Forests and Woodlands. Los Alamos: Los Alamos Historical Society. Amazon carries an edition whose publisher is listed as University of New Mexico Press. Irish, Gary and Irish, Mary F. 2000. Agaves, Yuccas, and Related Plants: A Gardener's Guide. Timber Press. Hauth, Katherine B. and Kay Sather. 1996. Night Life of the Yucca: The Story of a Flower and a Moth. Ages 9-12. Roberts Rinehart Pub. Medicinal Plants of the SW from New Mexico State University.